Aardman Campaign to Bring Back Morph! After an amazing response from the public, Morph creator and Aardman co-founder Peter Lord is campaign to bring back Morph for a new series of adventures! Competition: Can you fit 20 people in a box and still lift it? WIRED magazine are holding an exciting new event for young people aged 12-18, offering talks and workshops with interesting people from the worlds of technology, science, the arts, and business. 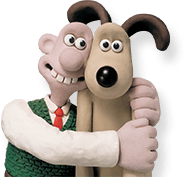 Aardman’s Gavin Strange is part of the line-up and to celebrate, we’re offering you the chance to win tickets to the event!